Today, Council Member Antonio Reynoso joined fellow New York City Council colleagues, Teamsters Local 813, and advocacy organizations such as New York Lawyers for the Public Interest at a press conference at City Hall to call attention to the prevalence of sham unions in the private carting industry and the labor violations they subject workers to. Those gathered also rallied for the passage of legislation that would help to eliminate sham unions and protect workers’ rights. For years, elected officials, unions, sanitation workers, and community organizations have been working to expose the corrupt and heinous practices that run rampant in the private carting industry. Of all the safety, environmental, and labor violations that plague the industry, one of the most egregious is the prevalence of sham unions that work to undermine legitimate labor organizing. The Teamsters’ organizing and support of workers, and the tireless work of reporters like Keira Feldman at ProPublica were critical in unveiling the prevalence of these issues within private carting industry and the dire need for reform. Private sanitation workers present at the rally testified to the working conditions within the industry and the role that sham unions play in perpetuating them and undermining workers’ rights to organize. Currently, the Business Integrity Commission (BIC) is charged exclusively with regulating private carting companies themselves. However, labor organizations aligned with the companies are currently outside of their purview. This blind spot in the agency’s authority has allowed organized crime to continue to maintain a presence within the carting industry. Those present at the press conference showed their support for a few critical pieces of legislation —a bill recently introduced by Council Member Antonio Reynoso would authorize BIC to investigate union officers associated with the private carting industry. By closing the loophole in the agency’s authority, this bill would enable the agency to fully root out organized crime from the industry and ensure that unions are supporting the workers and not company ownership. Another bill introduced by Council Member Antonio Reynoso would codify BIC’s mandate to report labor and/or wage violations that violate City, state, or federal labor or employment law. A bill introduced by Council Member Francisco Moya mandates that BIC conspicuously post and disseminate to all workers a list of their rights and the Commission’s complaint process. Private sanitation workers have been exploited at the hands of private carting companies for far too long; it is time they were extended basic work place protections and the right to legitimate union representation. The legislation put forth by the City Council will enable BIC to investigate sham unions, while expanding and codifying protections currently in place for private sanitation workers, ensuring that New York continues to be a union town that protects its workers. “The City Council is committed to ensuring that workers in the private carting industry are protected. Strong unions are particularly important for these workers, who work hard in potentially extremely dangerous conditions. I applaud Council Members Reynoso and Moya for these bills, and all of our colleagues for their efforts to improve the private carting industry to guarantee the safety and rights of the workers. I look forward to continuing these efforts to make the private carting industry safer for all,” said Council Speaker Corey Johnson. “The difference between the Teamsters Union and the so-called unions we are talking about today is that we fight every day for sanitation workers, while they fight for the bosses. At company after company, sham unions were brought in to replace the Teamsters or stop a union organizing drive. The result was declining wages, the loss of pensions, and workers who had no advocate to address unsafe conditions. We commend Sanitation Chair Reynoso and the City Council for taking on the problem and working to close this loophole to keep corrupt individuals out of the private carting industry. 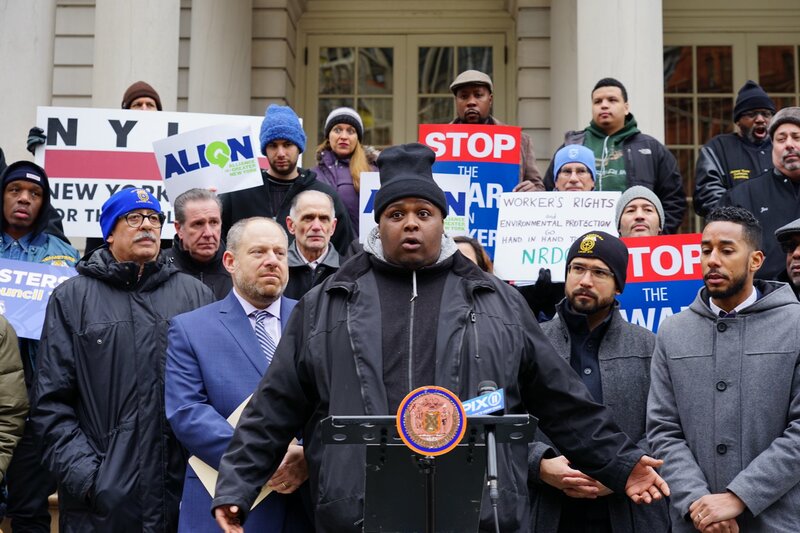 This bill will support the City’s commercial waste zone system in raising standards for private sanitation workers,” said Sean Campbell, President, Teamsters Local 813. “At a time when worker power is in decline throughout the country, the role unions play has never been more necessary. Labor unions are supposed to protect workers, ensuring they receive the benefits and pay they deserve. Unfortunately, sham unions in the private carting industry do the opposite – they ally with company management to exploit workers, denying them the right to organize and collectively bargain. We need strong enforcement tools to deter this kind of behavior, and ensure unions work for workers, not CEO’s. I applaud Council Member Reynoso for championing this legislation, and am proud to stand with him as we work to reform the private carting industry,” said Council Member Espinal. “Private carting workers need a strong and dedicated union, because many companies in the industry have ignored worker safety and wage laws. When a loophole in industry oversight allows companies to partner sham unions, workers are denied their fundamental right to join a legitimate union. This legislation will complement the larger reforms of the commercial waste zone policy to ensure that the workers who collect our commercial waste every night are protected,” said Council Member Justin Brannan. “In an industry where workers’ rights abuses are widespread and issues such as wage theft are all too common, we in the city need to take a stand and enact protections for people who undertake this difficult work for our city. I thank Council Member Reynoso for his work in taking on this issue, and all of the workers who have come forward to share their stories. Together we can make this industry, and this city, more fair to and supportive of working people,” said Council Member Jumaane Williams. “Workers in the private sanitation industry need protection — protection from unscrupulous companies eager to put profit over safety, and protection from a sham union, LIFE 890, that undermines, rather than stands up for, their rights. I’m proud to support these Council bills that will help put an end to corrupt sham unions and dangerous practices that jeopardize the lives of workers in the private carting industry,” said Council Member Rory Lancman. “We must commit to reform in the private sanitation industry that will provide the highest working standards and ensure that workers and the public are safe, and put an end to industry corruption. I commend my colleague Council Member Reynoso for leading this effort to authorize the Business Integrity Commission to evaluate unions associated with the private carting industry,” said Council Member Keith Powers. “While the private carting industry picks up garbage, it treats its own workers like trash. For too long, this industry has exploited its workers and subjected them to deceptive practices. It is corruption in its most brazen form to use the very means available to workers to fight for their rights against them. The fierce advocacy of the teamsters and reporters such as Keira Feldman make it clear that reform is necessary. We must close this loophole and authorize the Business Integrity Commission to shut down sham unions, and I am proud to stand alongside my colleagues in calling for this legislation,” said City Council Member Carlos Menchaca. “The private carting industry is notorious for it’s mistreatment of workers. It shouldn’t come as a surprise that many of the workers are victimized due to their prior criminal convictions or their legal status which makes them more vulnerable to exploitation, and bad employers know to take advantage of their situation. We are proud to stand by the workers and CM Reynoso today. These three pieces of legislation will ensure that BIC reports wage theft, it will educate workers on their right to organize and finally allow workers to recognize and act when they are being misrepresented,” said Maritza Silva-Farrell, executive director of ALIGN. “These bills represent a real response to what private sanitation workers have been reporting for years—that fake, sham unions have cropped up throughout the waste industry, allowing some of the most notorious employers to continue to work with individuals who have been banned from the industry for links to organized crime. These bills close a loophole in BIC’s authority to rid the industry of corruption, and hopefully represent the first step in raising labor standards in what has been a race-to-the-bottom industry,” said Melissa Iachan, Senior Staff Attorney at New York Lawyers for the Public Interest. “Ensuring that private sanitation workers are given basic information on working conditions, are fairly paid for their time on the job and are represented by labor unions that meet minimum standards of good conduct are rights fundamental to a just and equitable waste collection system. For these reasons, we strongly support the sensible, progressive legislation being advanced today by City Councilmember Antonio Reynoso,” said Eric A. Goldstein, NYC Environment Director at the Natural Resources Defense Council. “NYC-EJA stands with the Teamsters and Councilmember Reynoso as they address the rampant corruption within the private sanitation industry. Many private haulers continue to use sham unions to exploit workers of color – many of whom hail from the environmental justice communities where waste facilities are clustered,” said Eddie Bautista, Executive Director, New York City Environmental Justice Alliance.